Yes, a beautiful west-side expanse called Lincoln Park once blessed Cincinnati from 1867 until Union Terminal replaced it. But no, the Lytle Park Lincoln wasn’t there. Lincoln Park had its own monument, designed and donated by a local marble company. And it was much more than a statue: It sported 25-foot marble columns that surrounded a pair of marble lions that guarded Mr. Lincoln’s marble (and bearded) visage. Unfortunately, a dispute arose with the city over whether the $10,000 monument had actually been a donation, so the marble company skulked into the park one dark night in 1872 and took all its marbles home. 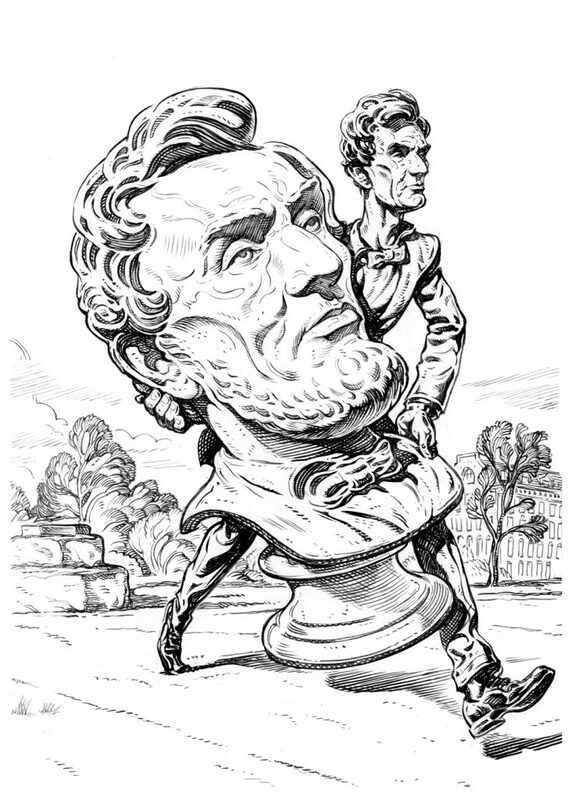 The company later found a customer in Pennsylvania planning a monument for someone else, so they quickly moved the Lincoln bust to a shelf, sculpted the someone-else, and put it, the columns, and the lions onto a train. The train then proceeded to fall off a bridge, destroying everything. Thank goodness, that bust of Lincoln was still safe in Cincinnati! Until the day it slid off its shelf and shattered. Moral of the story: if you renege on a marble gift to Cincinnati, the marble is cursed. Modern version: if you renege on a gift of concrete, only your football team is cursed. As with many profound questions that cross the Doctor’s desk, your answer requires some nuance. The demise of the Oakley Drive-In—ah, sweet memories of romantic back-seat contortions—means that today’s Kenwood Towne Centre employees must park on-site during December madness, albeit in distant “designated areas,” leaving the closer spaces for customers. Here, however, is the nuance: The Centre’s new neighbor, Kenwood Collection, features hundreds more spaces in a parking lot and garage, and the two malls are contiguous. Still, as you suggest, none of these facts change the predominant fact: Finding a parking space during the Christmas shopping season is a major obstacle to achieving Peace On Earth. One reason is that there are simply more people in the neighborhood than ever before. When you think about it, this can be blamed— partially, at least—on the Oakley Drive-In. Future Decembers may see some improvement. The Doctor always welcomes inquiries that require restaurant write-offs. Mmm. Oh, that’s right, you asked about the building. It arose in 1930 as a gift from Arthur Morgan to his son, Urban, serving as a storefront for the younger’s European-focused interior decorating business. Hence, the impressive French design. Mr. Morgan the elder was president of both U.S. Playing Cards and U.S. Printing and Lithographing. Hence, the impressive budget. Decades later the building became headquarters for Fred Ziv, and to say that Mr. Ziv “had something to do with television” is like saying that Mark Zuckerberg “had something to do with Facebook.” From his office on Madison Road, this guy launched and dominated television syndication—and therefore American popular culture—during the 1950s. Just one example: the hit show Sea Hunt made Lloyd Bridges a major star, meaning that our world may never have experienced Jeff Bridges as The Dude without Cincinnati’s Fred Ziv. The building later went through its obligatory period of neglect, but in 2015 its renaissance was assured by the arrival of O Pie O, whose meals and pies, hot and cold, deserve only the highest—oh, that’s right, you asked about the building. Mmm.